A recent pattern I’ve noticed with YA books is that the book summaries don’t help to describe the book. In other words, authors these days like to put in a lot of plot twists that detract from the book itself. I understand why readers may enjoy this type of plot, but I am not one of those readers. I think the plot was one of the many reasons that added to my dislike of the book. In Thirty Sunsets, protagonist Forrest Shepard is dealing change. Her brother Brian’s girlfriend, Olivia, has been invited to spend the summer with Forrest’s family at the beach house. In other words, Forrest really hates Olivia and will do whatever it takes to unveil her true character, including spying on Olivia to prove that she has an eating disorder. At least, that’s what it is in the beginning. Soon Forrest realizes that nothing is what it seems. Let me return to my discussion of the plot. Thirty Sunsets‘ plot has two major plot twists that are completely out of this world, resembling reality TV better than real life. OK, I understand this can happen in real life, so I’m not going to critique this anymore. That being said, this plot mentions very mature topics. I recommend a minimum age of thirteen for readers. I do laud the author for bringing up controversial issues though. I feel like most authors are afraid to take on many of the problems with society today. Perhaps my biggest annoyance was the characters. Forrest’s character development was predictable and definitely needed, seeing what she started out with. I found her underdeveloped, whiny, and shallow. I don’t care if the characters start out with unlikable characteristics- I just want a relatable, realistic character. As a whole, the characters in Thirty Sunsets are underdeveloped and unrealistic. Continuing with the idea of characters, many of the actions of certain characters did not match with their personalities. The first-person writing style was pretty good. Although certainly not the best writing I’ve read, I definitely enjoyed Christine Deriso’s writing. I will say that it wasn’t consistent. Some things were described in excruciating detail while others were simply passed over. The inconsistencies were a little annoying; although overall it’s pretty forgettable. 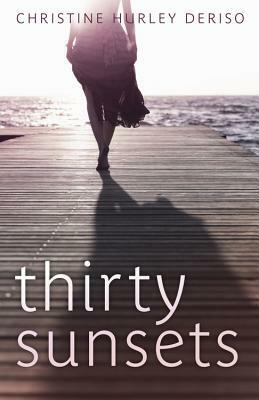 Thirty Sunsets comes out on July 8th! Do be sure to try it out- you just might find your next favorite book!